Gary Warby, Managing Director, Premier Windows draws up a list of 10 window, door and conservatory maintenance tasks to complete this autumn. The saying goes that ‘you should fix the roof while the sun shines’ – and it doesn’t only apply to roofs. It’s really important going into winter to run some basic maintenance and performance checks on your windows, doors and if you have one, conservatory, so that if there are any niggling issues, you can tackle them before the weather turns and they become a problem. 1. Check window and door frames for damage or wear Window frames are in the front line when it comes to protecting your home against the elements. Check to make sure frames are in a good state of repair. PVC-U windows generally require less maintenance but if you have wooden windows or doors make sure that it hasn’t warped, shrunk or softened in the corners, particularly along the putty line where it meets glass. Replace any rotten timber with suitable filler, sand and re-pant or varnish if any damage is present. 2. Inspect gaskets Gaskets are just as critical in defining the performance of your windows. Make sure that wooden and aluminium window gaskets are in a good state of repair and still firmly attached to frames and sashes and haven’t become loose. Loose or damaged gaskets in PVC-U windows are less of a problem as they’re co-extruded with frames which means they are less likely to dislodge or become damaged. 3. Carry out basic maintenance on windows and doors All windows and doors need a little TLC to keep them in perfect working order – even low maintenance PVC-U windows. As a general rule, all moving parts of the window, for example locking mechanisms, handles and hinges, should be oiled with a 3-in-1 or graphite-based lubricant at a minimum of every three-months to maintain optimum performance over their lifetime. 4. Make sure the sash is operating correctly Window and door sashes (the opening part) can drop or loosen over time and with use. You’ll know because you’ll either feel a draught where it meets the fixed frame or feel it catch as you open and close it. This means that the window gasket isn’t being properly compressed which can compromise the performance of your window. A professional window installer can easily adjust this as long as your door or window is in otherwise sound condition. 5. Check window units for any signs of damage The insulated glazed unit or double or triple-glazed window unit, which sits inside the frame is critical in defining the thermal efficiency of your windows. If you notice that it’s misted on the inside, it means its failed and the special energy efficient gas which is key in defining its performance has ‘escaped’ so that the window is only filled with air. This will slash its performance, which means higher heating bills this winter, so you need to act now and get it replaced. 6. Is your home properly ventilated? With winter on the horizon it can be tempting to batten-down-hatches and wait for spring, but you need to keep your home properly ventilated – even during winter. High performance energy efficient windows are fitted with trickle vents, which provide background ventilation, preventing the build-up of moisture inside your home. If it’s not properly ventilated, it can lead to increased humidity inside your property and associated problems, including the growth of black mould, some variants of which can cause significant health problems. The good news is this can be avoided even without trickle vents through regular opening of windows. Alternatively, trickle vents can be retro fitted. 7. Vacuum window and door tracks and make sure drains are clear Your windows and doors feature a series of in-frame or over face drainage channels. These are there to allow any water build up to drain our and away from the window or door and away from your property. They can, however, sometimes become clogged with dirt or the detritus of everyday life, for example, if you have a pet, shed hair. It’s really important that going into winter these channels are kept clear, particularly bi-folding, inline sliding patio and entrance doors, so give them a really good vacuum, removing any debris. 8. Check conservatory gutters and drainage It’s the same problem but on a bigger scale. Rubbish, leaf mould and moss, has a habit of settling in gutters. 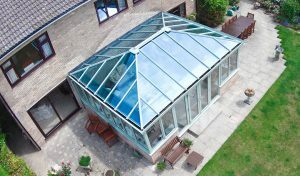 Your conservatory is no exception. Blocked gutters and consequential overflow can cause serious long-term damage to your conservatory or home. It’s key that you make sure that all internal guttering, face gutters and down-pipes are clear and able to cope with winter rainfall. 9. Security checks It’s important that your home security is up to scratch due to the darker evenings. If you have an older timber of PVC-U panel door, all that stands between your property and an intruder is a solid and well-placed kick. Even some older high security composite doors in common with older PVC-U doors have a historical vulnerability. This is dependent on the door cylinder type i.e. where you put your key, which can easily be exploited to gain access. Also make sure that any windows are locked, with the keys removed, when you’re not at home. 10. Replace older windows and doors? The majority of checks we’ve highlighted above are low cost or you can do yourself. If, however, you have older windows and doors, perhaps 15 or more years old or they’re still single-glazed, you may want to consider their replacement. Autumn is the perfect time to put your ‘house in order’ because you’ll benefit from your investment for throughout the winter ahead and many more to follow. The savings can be significant – up to £200 per year through reduced heating bills where single glazed windows are replaced with energy efficient double or triple glazed windows in the average three-bedroom home. If you do find something that needs fixing or you simply want a second opinion, please don’t hesitate to contact us. We have a team of remedial work engineers, who can offer advice and support on everything from misted double glazing to ‘clunky’ locks and opening, making sure that your home is ready for winter. Please email us at gary@premwindowsanddoors.co.uk to find out more.